Gústache a lectura?, Queres mellorar as túas habilidades orais en inglés? 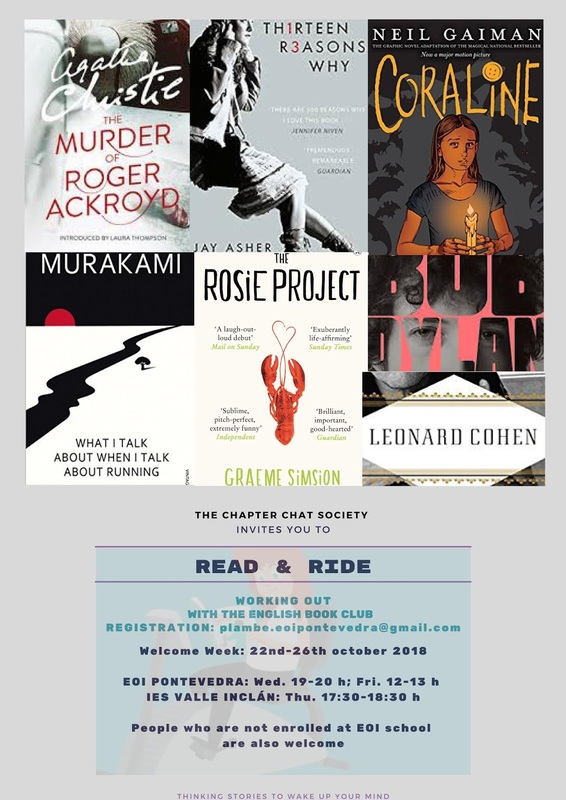 The Chapter chat society anímate a participar en Working out with the English book club, unha escolma de lecturas nas que faremos actividades de quecemento, poñeremos en forma o noso corpo e as nosas habilidades sociais e remataremos cunha sesión de relaxación e estiramento. Consulta o calendario de reunións e información sobre a lista de libros. Wordreference: The most popular online dictionary of all times! Urban Dictionary: Try looking up new words. Oxford Learner's Dictionary: The traditional Oxford Dictionary now online. Real English :graded lesson videos based on real English interviews. ESL Video : multiple choice listening comprehension exercises. English Yappr : choose a video by topic and read the subtitles simultaneously. Podcasts in English: listening exercises with transcript and worksheets. 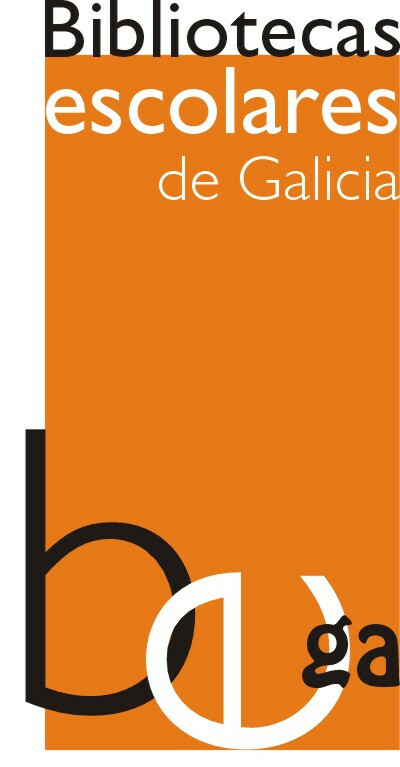 British Council. Listen and watch: listening comprehension exercises. Breaking News English: listen and reading comprehension exercises. Videojug: a repository of videos about all kind of subjects. Listen a minute: One minute audios with script and exercises. Lyricstraining: improve your listening skills through songs! Voices in the dark: Audio books and stories read aloud by real people for free! Ororo TV: Learn English watching TV series and movies for free! a4esl.org: English vocabulary graded quizzes. Bon's tips: Website by English teacher Manuel Bonillo to practise grammar. British Council: topic-based vocabulary exercises. Quiznet - BBC Learning English: multiple choice vocabulary quizzes. La mansión del Inglés: Website to practise grammar through games. engVid: Learn English grammar through videolessons. Language guide: Learn English grammar through interactive games. Learn English, Feel good: multiple vocabulary quizzes by topic. Learning Chocolate: Vocabulary learning platform with exercises classified by topic, including images and audios. ompersonal: free online school to learn English and pass English tests. English Club: vocabulary quizzes (elementary-intermediate-advanced). ESL Reading lessons: reading comprehension exercises. Project Gutenberg: Virtual library for free English resources. My English Pages: reading comprehension exercises. Gocomics: American website for comics. Newspapers and Magazines: The Guardian, The Times, Daily Mirror, The Sun, New York Times, USA Today, Time, Forbes. My English Pages: writing tips for English learnners. Spell Up: Online game for Chrome that helps improve pronunciation and spelling. Listen and write: Dictation website that allows students to improve their listening and writing skills as they listen and write songs, poems, news and many others. Blog para preparar el writing de la EOI: writing tips to prepare for your "Certificación" exams. Sample Writing for English Exams: Prepare online with free writing resources. PenPal World: Site where you can meet pen pals from every country on the planet! Aprende Inglés Sila: Web to improve pronunciation. Duolingo: Web and app to learn English, including speaking, in an interactive way. italki: Get one-on-one online lessons with native language teachers and connect to people around the world. Vocaroo: Easy and quick way to share online recorded messages. Guía ESL de sonidos vocálicos en inglés: Learn vowel combinations in English. Forvo: Listen to English words with different accents. Vaughan Radio: Online radio to practise pronunciation with listen and repeat exercises. Subinglés: Website to learn English through singing! English Pronunciation: App for Android to learn pronunciation. Otterwave: App for IOS to learn pronunciation. The Speech Accent Archive: Set of speech samples from a variety of language backgrounds. Phonetics Focus: Learn phonetics in an enjoyable way! Useful apps to learn English on your mobile! The Cavern: blog do nivel Intermedio I. Have Fun with English: blog dos niveis Intermedio I e II. English is FUNtastic: blog do nivel Avanzado II.